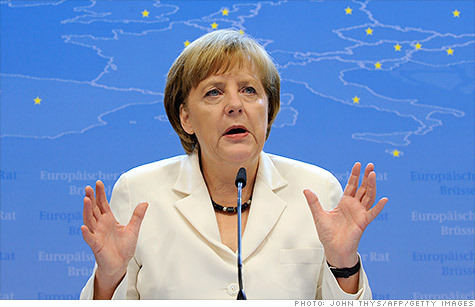 The economy of Germany, lead by chancellor Angela Merkel, outperformed its European peers in the second quarter. NEW YORK (CNNMoney) -- The eurozone economy stumbled through the second quarter with a modest decline in gross domestic product, according to preliminary estimates released Tuesday, but Germany trumped expectations as a bright spot in the zone. GDP for both the nations that use the euro and all 27 members of the European Union fell by 0.2% in the second quarter, compared to the prior quarter, according to a flash estimate from Eurostat, the EU's statistical office. In the first quarter, the eurozone GDP was unchanged and the EU-27 GDP grew by 0.1%. Germany's GDP rose 0.3% compared to the prior quarter, while the French GDP was flat. Both figures beat expectations. "The German economy has once again escaped the technical recession many other eurozone countries are currently experiencing with no more than a fright," said Carsten Brzeski, senior economist at ING. "In fact, the economy remains the strongest of the eurozone." But Brzeski said that German growth could slow down in the near future, since new orders from its European neighbors -- a big part of the German economy -- are drying up. "The safety net of richly filled order books and low inventories have become thinner very rapidly, not boding well for growth in the second half of the year," he said. "We should not get carried away by a seeming invulnerability of the German economy." European investors reacted favorably to the GDP results. London's FTSE rose 0.3% in afternoon trading. The DAX in Frankfurt jumped 0.6% and the CAC 40 in Paris rose 0.4%. Wall Street also got a boost after the bell.